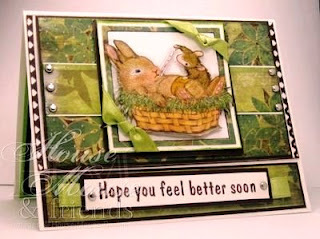 Cards by America: Bunny Boo Boo, HM&F Challenge #35, "Get Well Soon"
Bunny Boo Boo, HM&F Challenge #35, "Get Well Soon"
The stamp is by Stampabilities, HMD-House Mouse Designs, "Bunny Boo Boo", #HMOR1035. Image is colored in with Marvy LePlume Markers & CTMH Chalks. The Sentiment is also by HMD. Designer Ribbon, CTMH Silver Brads and MS punched borders complete this card. Thanks for looking & dont forget to check what the rest of our Design Team has come up with for this week's challenge! Ohhh, this is so sweet. I have this image and you did a great job coloring yours. Your DP is perfect with it. Fabulous card! I re-sent my e-mail from last week to you with my address. Let me know if you got it. I don't know why you didn't get the first one....sorry 'bout that. Look how darling, I love all the green, your card rocks!!!!!! Oh America this is absolutley gorgeous. What fabulous colours and papers and I just love that image, especially it's name - 'Bunny Boo Boo' that in itself makes me giggle. A truly adorable card. AWWWWWWwww, this is way toooo sweet!!! I love it :) you did a great job with the colors, and your coloring!!!!! Beautiful job hun!!!!! This is sooo adorable! I just love this image and the mix of papers you used! This is the sweetest Get Well Card I have ever seen!! Great coloring and design! So sweet and cute America!! You are seriously amazing, girl! Wow, look at that DP....SUCH a great compliment to the image. Very sweet card! What a wonderful card. I know who ever receives it will immediately feel better. Great job! Love the colors. America, You did a wonderful job on this card. The background papers match the color of the grass, which just makes the House-Mouse images pop. (The House-Mouse gang loves it so much, that they want to share a little secret ... the artist behind us mice, Ellen Jareckie, actually drew this card for her Dad, after he had stomach surgery, hence the bandaid across the belly.) Keep on stampin' on. Awww, this is precious! What a wonderful job you did on the coloring! Great card! So sweet! Love that dp - goes so well with the image. Awesome coloring! Awesome! Okay first love the image, so totally sweet. Great layout, colors and card. Just love it all. Wow, such an adorable card, America! That image is the cutest and you colored it so nicely!! Love all the pretty colors! It's beautiful! I love this card. It's beautiful! Love this Ms America!! That image is too cute, and I'm such a fan of all the green!! This is so cute!!!! Love the darling image and your colors!! Your car is adorable. Lovin the green on green. Your coloring is amazing, it gives the image great depth. Love the card. Just gorgeous! I love the patterned papers...such a cute jungle feel. Thanks for the sweet comment today. You have amazing coloring skills, no need to compare! Ahhh! This is so cute! Love the greens!